With a sleek yet highly protective design, the Ejendals Tegera 517 Thermal Waterproof Outdoor Work Gloves have a variety of features that make them effective for use in harsh outdoor conditions. Windproof, waterproof and thermally insulated, they provide all-round protection against the elements. The Ejendals Tegera 517 Outdoor Work Gloves are designated Category II gloves, meaning they are suitable for medium-duty applications and intermediate risks. The Ejendals Tegera 517 are available in four different sizes. Please measure the circumference of your hand around the knuckles (excluding the thumb) with your hand open and your fingers together, and the length of your hand from the tip of your middle finger to your wrist. Please note that these gloves are designed for a close fit in order to provide dexterity for precision tasks; they feature a palm thickness of 0.7mm. Very impressed with the general aspects of the gloves; good fit, comfortable, warm. The stitching on the velcro doesn't seem to be too good, starting to fray after only a day's use but will keep an eye on them. Bought two pairs size 8 I’m female and petite and my husband is medium build. On me a bit big and on him could have done with size 9! These are amazing not too thick warm and waterproof! Bought for winter hiking perfect! 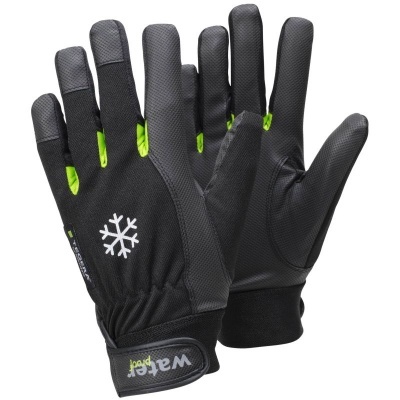 Excellent gloves for thermal protection whilst working. Worn them everyday all day at work for a week and no major signs of fatigue or degrading. For the price point worth it every penny. Brought thermal/waterproof gloves for my partner as he works outside. He said they did the job and kept his hands protected and warm. Usually my wife does the shopping but as I was buying her a pair of gloves for Christmas, I added a pair for myself to wear at work (garden & small farm work). These are good waterproof, warm gloves and well worth the money. They do not seem heavy duty though but ideal to wear driving the tractor or hedge trimming. I will buy another pair soon and go for a size bigger as mine are quite a snug fit.